"It is easy to prepare and everyone I have made it for really likes it! Serve with bread and your favorite vegetables, if desired. (Note: You can also use 2 pounds of chicken breast meat instead of a whole chicken; I like to cook my chicken ahead of time and freeze it, so that it is even quicker to make when I'm ready)." Cook spaghetti in a large pot of salted boiling water until it is al dente (about 8 to 10 minutes). Drain and set aside. 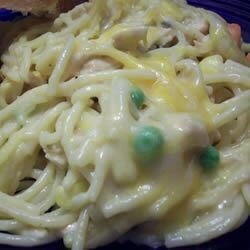 In a 9x13 inch baking dish combine the shredded chicken, cooked spaghetti, soups, water, salt and pepper. Mix all together. Sprinkle cheese on top of mixture and bake in preheated oven for 20 to 25 minutes or until cheese is melted and turning slightly brown. Let cool 10 minutes and serve! Yummy! So easy to do especially if you make the chicken ahead of time. I cooked the chicken the day before in the crock pot with a lot of seasonings. The leftovers were awesome. My whole family loved this recipe! I used milk instead of water, and added thyme and poultry seasoning. So simple, yet delicous. This was delicious! I made it with bow ties instead of spaghetti and used Tyson frozen diced chicken. How much easier can it get!! My husband and I loved it.